Polar Bear Coolers is one of the prominent coolers in the Industry. Apart from manufacturing the coolers or ice chests, they deal in drinkware, apparel, and accessories. Coming to coolers, they have an impressive product line up, especially in the Soft Sided Coolers. These coolers come in different sizes and storage needs to meet every customer’s demand. So, let’s proceed to know more about the product line up of Polar Bear Coolers, their specifications and much more. Polar Bear is the only brand that focuses highly on the Soft-Sided Coolers rather than the Hard-Sided Coolers. Across the Polar Bear Soft-Sided coolers, you have an abundance of options to choose from. These coolers come in different sizes and storage capacity and you will definitely find that perfectly meets your storage need. Let’s get in detail about the Polar Bear Soft-Sided Coolers. Polar Bear deals in five series of Soft Sided Coolers i.e Nylon, Solar Bear, Eclipse Coolers, H2O Waterproof Coolers, Tracker Coolers. Under the Nylon Series of Polar Bear, you can choose from a huge but not so huge variety of coolers. These coolers come in different size and storage capacity so that you don’t have to compromise with the product. Under this category, you can choose from the 6 pack Nylon Soft Cooler, 12 pack Nylon Soft Cooler, 24 pack Nylon Soft Cooler, 48 pack Nylon Cooler, and Polar Bear Nylon Backpack Coolers. Despite being limited in options, these coolers are the much-upgraded version of Nylon Coolers. Nylon coolers served the basic purposes with basic features. Unlike Nylon coolers, these coolers are UV Resistant. You can choose from the 12 pack Nylon Solar Bear Cooler, 24 Nylon Solar Bear Cooler, 48 Nylon Solar Bear Cooler, and Nylon Solar Bear Cooler Backpack. The Eclipse Cooler series and the H2O Waterproof coolers are same. The major difference between these series lies in the fact they offer more variety as compared to H2O Waterproof Coolers. Like the eclipse coolers, these coolers come with the lifetime warranty with almost same ice retention life. Coming to our next series which is Eclipse Coolers. These coolers come with the closed cell foam insulation which offers a great ice life. As claimed by the Polar Bear, these coolers can retain the ice for 3 days. Apart from this, these coolers are guaranteed leak proof and to back up their product, these coolers come with the lifetime warranty. Under this series, you have limited choice. You can either choose from the 24 pack eclipse cooler or eclipse backpack cooler. With the same features, specifications, the next series that we are talking about is Polar Bear Tracker Coolers. Like Eclipse coolers, this series does not offer much variety of coolers to choose from. You can only choose Mossy Oak Tracker Backpack Coolers. 1" Thick CLOSED-CELL Foam - Holds Ice For 3+ DAYS! Stainless Steel Hardware - 2 Bottle Openers Built-In! Now, we are well aware of the history of Polar Beer Coolers, their impressive and huge product line up. Now that we are pretty much informed about the Polar Bear Soft-Side Cooler Series, their models, the differences among each series, let’s proceed on to what we barely know. Yes, Let’s get to know about the features and specifications of Polar Bear Cooler Series. We have already talked about the various series of Polar Bear Soft-Side Cooler. There is a considerable difference in each series when it comes to the features and specifications. Great Quality – Made using the 1000 denier luggage grade nylon outer shell ensures the quality of the coolers. These coolers are unaffected by the scratches and the cuts. Moreover, the fabric will not tear out and the quality of the coolers are undoubtful. In addition to this, these coolers are designed using FDA Approved Liner which is a hallmark for the superb product quality. UV Resistant – Whether you set out on a journey during summer or whether you play your sports under the scorching heat of the sun, all these woes will vanish. These coolers are not bothered by the rays or heat of the sun. Being UV Resistant, the rays of the sun will not affect the ice retention ability of these coolers. Ice Retention Period – These coolers come with the one-inch High-Density Thick Foam insulation which boasts of the ice retention ability of these coolers. Despite being UV Resistant, these coolers are unaffected by the sun rays which further expands the ice retaining capacity of the coolers. Customization – Polar Bear provides the customization features towards the coolers. You can create your own design, pattern or even sports team logo. This feature of Polar Bear Coolers is much impressive otherwise the cooler would seem to be dull. Durability – You want a cooler that can resist the cuts or scratches. Moreover, you want something that lasts longer. The durability of these coolers is undoubtedly better. These coolers come with the FDA Approved Liner and the fabric that is used in designing the cooler will bind all the thread and will not let them tear out. Apart from this, the components of the coolers are made up of Heavy Duty Plastic that ensures the longevity. Mobility – Coming to the mobility, these coolers don’t have such premium features rather they have some basic features that add to your convenience. Talking about the mobility, these coolers come with the shoulder strap that allows you to carry the coolers on your shoulder. You can also use the overhead handle to easily move the cooler from one place to another. Insulation Ability – These coolers come with features that obviously increase the ice retaining capacity of the coolers. Talking about the Ice retaining capacity, these coolers are UV Resistant and when they come in contact with the sunrays, these coolers are not affected by the heat of the sun. That’s the one reason that these coolers have a greater ice capacity. In addition to this, these coolers come with the High density thick insulated foam that further increases the ice retaining capacity of the coolers by locking in the cold air. Visual Appearances – These coolers are much decent in their looks. Depending upon the model and series you wish to go for, the visual appearances might vary. In case, you don’t like the appearances of coolers, Polar Bear allows to customize your cooler. You can get your own design, print or pattern as you desire. So, Visual appearances will not be an issue. Polar Bear Coolers really impressed us. Their wide offering, premium specifications are something that one instantly gets lured. When it comes to performance, these coolers take up the rivalry with other brands. Coming to the ice retaining capacity, even the smallest the cooler can retain the ice for up to 24 hours. In addition to this, the customization feature offered by Polar Bear will not let your cooler look dull and that’s really impressive. Our more Cooler Reviews are just a click away. 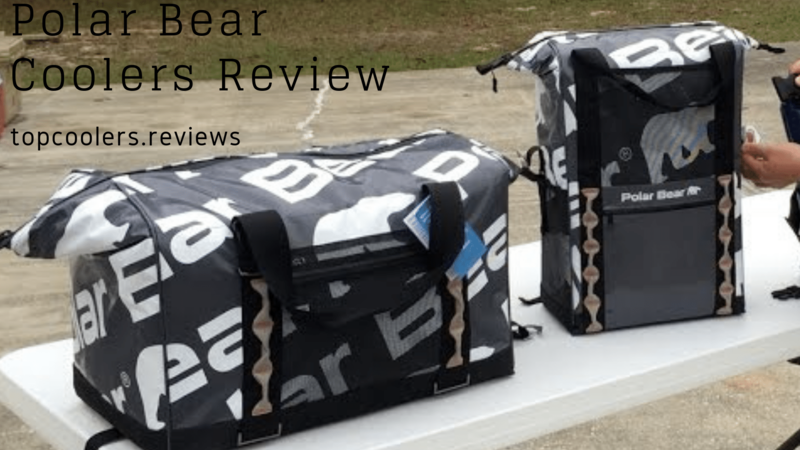 We hope you would have loved our reviews of Polar Bear Coolers. So, what’s holding you back? Hold up your devices and add your favourite coolers in the cart.